Searching for a house painter for your Roswell home? Sure there are plenty of house painters with a low cost that can slap some paint on your home. However, most homeowners in your area are looking for little more out of a painting contractor than just being fast and cheap. You see, at American Painting and Deck Care we understand your home is your castle, so you can expect superior service and quality work you can be proud of.Please let us know if you would like a list of references and we would be happy to provide that for you. There are many factors to consider when painting the interior or exterior of your home or business. Attention to detail is one of the very best traits a painting company can have. At American Painting and Deck Care we cover the details with you throughout the entire process. An exterior or even an interior paint job is something you want to enjoy for many years, so it’s important to get it right the first time! We take the time to educate you on all the aspects of quality paint work so you can make the best decisions for your home and your budget. Choosing colors you will love for years to come can be sometimes be a daunting task. On top of that you will also have to choose the finish type – flat, enamel, eggshell, satin, semi-gloss, or high gloss. Don’t worry, we can help you through this process. American Painting and Deck Care uses top quality name brand products for the best results. We will assist you in choosing the right products and finish options to acieve the results you are looking for. We would be happy to move furniture around to make room for our painters to work. Naturally there is a small fee associated with this extra step. However, you could save a little money if you choose to do this on your own. It’s completely up to you. Any experienced painter will tell you that it is imperative to have the surface to be painted prepared properly. Without taking the time to complete this step you will end up with results you are not happy with. This could mean sheetrock repairs, wall paper removal, sanding, pressure washing, caulking and more. With over 14 years in the Atlanta market, American Painting and Deck Care has painted many homes and businesses in Roswell, Dunwoody and surrounding areas. Our goal is to transform your home into something you can be proud of for years and years to come. 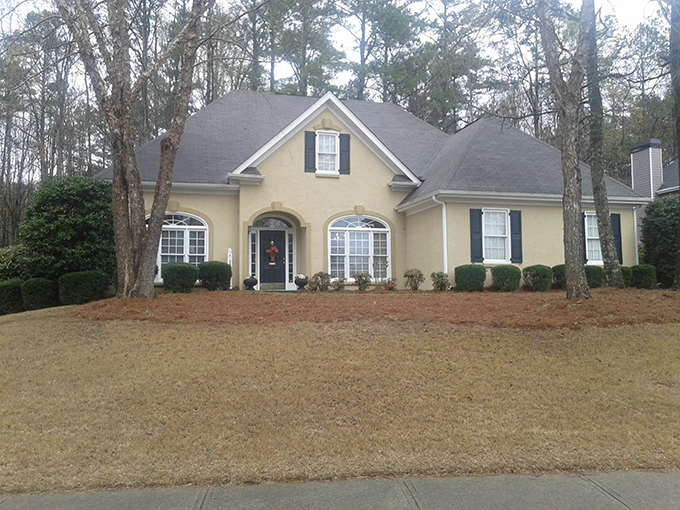 Here are a few homes and businesses in Roswell GA we have painted. American Painting and Deck Care wants to be your family’s go to painter for life. Our team of highly skilled and experienced professional painters are dedicated to your complete satisfaction. Call us today to schedule a free consultation and estimate.